“I’m grateful that my car got towed and I’m out $322” was not a phrase I’d expected to say by the end of the day. But God is funny that way. The sermon that morning was about money, and how uncomfortable we are talking about it—especially in church. One woman shared about her shame around not having enough to care for herself, another man his experience that money is not a thing, but a language. Our preacher brought us back to the table and God’s currency—the bread and wine—that all are called to receive, without exception. 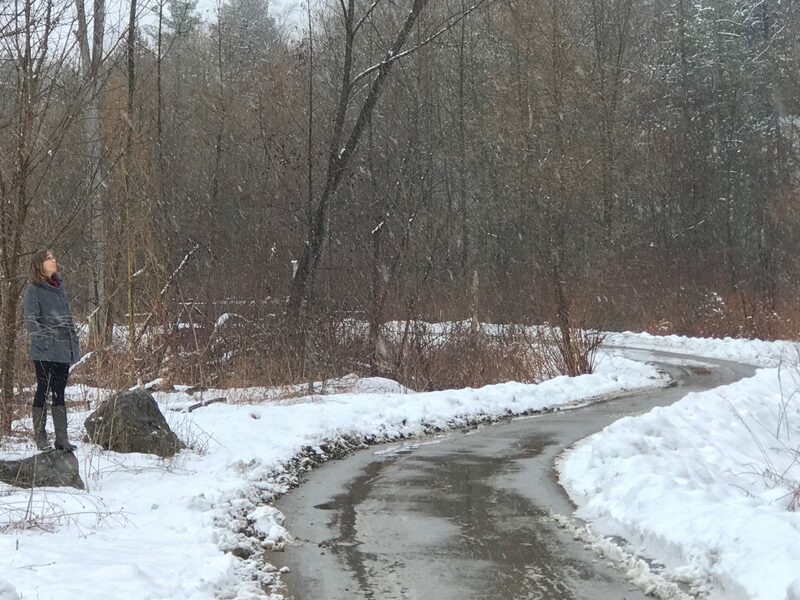 She reminded us of the way of communion at the Food Pantry and how we give groceries to all who come, without exception, much to the chagrin of non-profit norms and volunteers who have strong opinions about others worthiness to receive. But at the Food Pantry, and around that same communion table on that on Sunday holds the bread and wine, food is offered to all. Because that’s our best guess at following the way of Jesus. As the sermon time ended, the words “your ways are not my ways” rang in my ears as we moved towards Communion. And I remembered Friday. It had been my third week at the Food Pantry, and I had finally allowed myself to receive food. All the volunteers go shopping first, before we open the doors. But for my first two weeks, I had not partaken. I was thrilled to be there giving out the food, but, “No, no, I don’t need to take any.” My internal dialog was filled with stories of how others needed it more, and though yes, I am a grad student living on a frugal budget, I do have enough money to go to Trader Joe’s, and who am I to take food? But on Friday, I was convicted that if I was going to be part of this community, I needed to receive as well as give. Something happened as I walked around that circle, picking up plums, a watermelon, a beautiful box of strawberries, and four pineapple yogurts. And something happened when I ate one of those yogurts this morning on my way to church and felt the nurturing gratitude that I had breakfast to eat, though I hadn’t had time to go to the grocery store in days. Something similar happened when I walked from the seating area to the communion table. I took that currency that’s beyond the earthly substance, yet embedded in the bread and wine, and received together in community, without exception, something that is so beyond what any of us could earn. The bread of life that comes down out of heaven and gives life to the world. The opportunity to receiving that currency didn’t end there that day. ”Am I going crazy?” I asked, “I parked it here, right?” We walked up and down the block in disbelief and all four agreed, my car that I had hurriedly parked there at 7:00 am as we gathered to carpool to church, was now gone. I didn’t burst into tears; the thought of all that it might mean to deal with having my car stolen sent me into an exhausted frozen fog. “Really not what I need to deal with right now” I said, and went on to methodically call the police and go through 15 minutes of reporting and being sure my car was stolen. Then the phone rang and the Berkeley police deportment informed me that my car had not been stolen, but had been towed due to “partially blocking a driveway” (an allegation that all four of us felt immediately compelled to question). My relief at the car not being stolen was deep, though brief, as I talked to the towing company and discovered the price tag on getting my car back, and the extra fee for “storage” for the afternoon, as if my car was a studio apartment’s worth of boxes or something. My friends stood by and swore with me at the appropriate moments, and offered helpful support, and then we all piled back into my friend’s car and drove to the towing facility. I got out and was met by Diego, the towing guy. He went into the office to run my vehicle registration and my credit card, while I lifted the yellow carbon copy slip from under my windshield wiper. 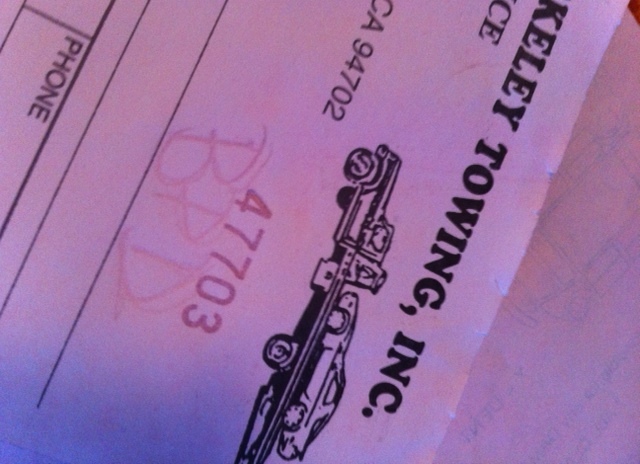 Finding there the added insult to the towing fee—the City of Berkeley wanted their cut of the car capture. I texted the tidings of this yellow scroll to my friends in the car. Along with insisting that they were going to take me out for food and drinks after my car was released, one, in good theological form, wrote: “If anyone asks for your coat, give him your shirt as well—right?” To which I replied, “Do I really have to be a Christian right now too?” And then went on to insist that I was being nice to the towing guy. But this moment of not yelling at the innocent towing guy was not the extent of what God was working on. Because God’s ways are not our ways. No, an opportunity to follow in the radical way of Christ and community, to be a Christian, would come through a text an hour or so later, with cheese fries in front of me and a frosty glass of cider in my hand. And then community happened. Again. Because even if you’ve only known each other for a few weeks, we are called to be the church for one another, and sometimes that means holding up a mirror. I looked and saw my self-reliant, independent, don’t-receive-help-that-you-can’t-repay self looking back at me, and I knew. The call to follow Christ, the call to be human, the call to live in community, isn’t all about the giving. It’s also in the vulnerability of receiving. Because if all are welcomed, without exception, to the bread of life, and if each one of us is a beloved child of God, worthy to eat that bread and drink that cup, then I can’t always be the one handing it out. Sometimes I have to put out my hands, and receive. Thanks for sharing your story. So beautifully written. Great reflections. Such a mystery is this life and the Holy. Love you, friend! This is a wonderful and deep story. Lots of love to you. Thank you Anna, Well said, and very real.